The diaphragm vacuum pump articles provides guidance and review about different types, qualities, durabilities, and prices. This pumps are used to transfer air, gases or vapor with the help of the diaphragm membrane. These pumps create the vacuum by transferring air, gas or other vapor from the required medium. These pumps don’t run on liquids and are used for dry running operations. These pumps do not require lubricants and hence can provide us clean and dry vacuum conditions. These pumps operate oil-free and without lubricants. The air or gas pumped out are usually clean and as they are not contaminated. The diaphragm which is made up of thermoplastic, rubber, Teflon or any elastomers. Check valves – installed at both the inlet & outlet ends. Cylinder – the container through which the air, gas or vapor is transferred to the different chambers. Power Supply - External power source is required to move the diaphragm in the cylinder. Initially, the diaphragm is pulled out in the cylinder and increases the area in the cylinder. Thus a partial vacuum is created in the cylinder. Due to the pressure difference, the air, gas or vapor molecules move into the cylinder through the check valve. The check valves allow the flow through one direction and block the backflow of the air. Now the diaphragm is pushed to compress the air. The compressed air flows through the discharge of the pump to the required chamber. The check valve is placed at the discharge side of the pump to stop the backflow. Thus the air or gas molecules are transferred, and vacuum is created in the required medium. The performance of the diaphragm vacuum pump is mainly related to the pump speed. The pump speed is defined as the volume of air, gas or vapor that flows at the inlet side with respect to time. It is expressed as volume per unit time. Diaphragm pumps operate at the lower speed of 0.25m^3/hr. to the higher speed range of 4.3 m^3/hr. They usually operate at low flow rates and small amounts of air or gases are only transferred. As they operate in dry conditions, thermal heat builds up in the casing and cylinder walls. The proper cooling system must be provided to dissipate the heat. Usually, air cooling methods are preferred. Mostly they are self-operating pumps where there is an inbuilt pressure switch is used to operate the pump. By-pass valve can be used to run the pump continuously and the discharge is closed when not required. During no discharge periods, the flow is transferred along the by-pass valve. Suitable for high discharge pressure. May even withstand pressure up to 1200 bar. Easy maintenance - we can just change the diaphragm and use the pump for long period. They are used in the various laboratory processes such as multi-flask distillation, infiltration, vacuum distillation and gel drying. 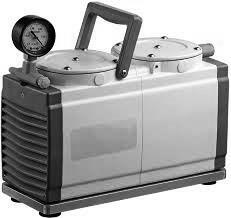 Vacuum pumps are used in industries where we have to fill the components with a certain mixture of the gases. They help to remove the air and then fill it with the required mixture of gases. They are mainly used in making CRTs, electric lamps, bulbs and vacuum tubes where the air is removed and the mixture of gases is imparted into them. They are also used in the plastic molding processes. Used to find leaks in the oil & gas pipelines. Used in the high-pressure tree spraying and lawn spraying applications in the households. Due to its oil-free operation, they are used in chemical industries for mixing various chemicals. They have used to power the gyroscopes in the airplanes in the case of the system failure. Diaphragm vacuum pumps are mainly manufactured by the companies such as Flojet Pumps, SHURflo Pumps, Sotera Systems, Warren Repp Inc., Pfeiffer Vacuum, KNF Groups and Hypro Pumps. They are available in small sizes such as ¼” to 4” for low flow rate applications. Their flow rate may vary from 1 gallon per minute(GPM) to 7 GPM. They can develop pressure ranges from 60 Psi up to 100 Psi. They are available in price range of around 10-15$ for small applications to high prices of 750$-1000$ depending upon their size and application.